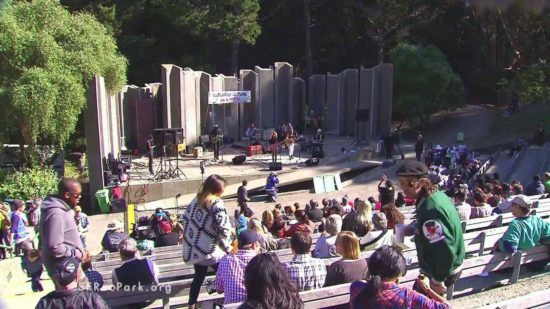 The iconic Jerry Garcia Amphitheater at McLaren Park features a variety of local performers and varied music genres in the late summer each year. Situated on a sunny hillside meadow and surrounded by tall shade trees, the Jerry Garcia Amphitheatre creates an intimate, friendly setting, allowing for the talents of these artists to truly shine. Enjoy bringing the family and a picnic lunch, away from the “hustle and bustle,” for a few hours on a weekend afternoon. Please note that not all of these events are on Saturdays… confusing, we know! How often do you celebrate an amphitheater’s birthday? 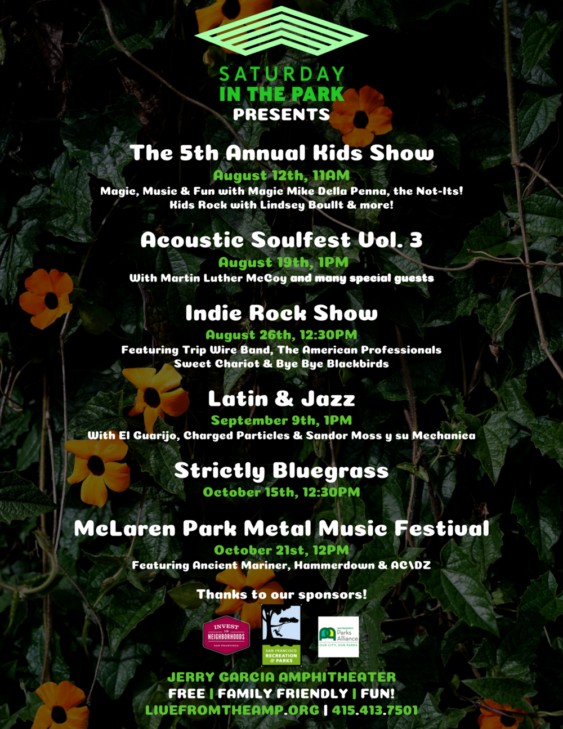 On Saturday, October 11, 2014, join music fans, neighbors and friends at the Jerry Garcia Amphitheater as they host Saturday in the Park, McLaren’s closing concert and party from 1-4 pm. Enjoy music, a bicycle camera obscura and cake in honor of the 43rd anniversary of the outdoor Greek-Style amphitheater dedicated in 2005 to local boy and iconic music legend Jerry Garcia of the Grateful Dead. During Saturday afternoon, the San Francisco Exploratorium is bringing a Rickshaw camera obscura onsite for the audience to experience. This unique early camera allows you view the outside scene in color and perspective using only a periscope, a mirror and a viewing surface within the rickshaw. Bring your dancing shoes as you boogie down to instrumental rock from Delmarva, bluegrass with the Beauty Operators, and Celtic jam band and Grateful Dead music performed by Wake the Dead. Blending Celtic traditional music, the songs of the Grateful Dead, music from the Summer of Love, folk tunes, rock, and adventurous music from around the world, Wake the Dead will delight you with their voices, music and banter — all with a nod to traditional Celtic melodies.